Stepes makes obtaining professional, on-demand interpretation services as easy as 1-2-3! Whether you need interpretation over the phone (OPI), on-site, via mobile, or through our Talk & Translate and Chat & Translate services, we always have you covered! Stepes provides professional interpretation services for corporate, medical, legal, and government sectors in over 100 languages. We have redefined the age-old language interpretation business by delivering on-demand and just-in-time interpreting over the mobile phone or on-site, around the clock and around the world. In today’s rapidly growing global economy, professional and quality interpretation solutions play an increasingly important role in an organization’s international success by enabling it to confidently interact with a global audience, customers and partners. Stepes have assembled one of the world’s largest network of on-demand interpreters to provide exceptional interpretation services in all major languages and dialects. Are you a hospital or healthcare organization that still relies on outdated interpretation services for your medical interpretation needs? Traditional interpretation services are not only slow, hard to use, and expensive, but they also often fail to deliver the desired results when your business needs language interpretation the most. Stepes mobile-powered interpretation technology solutions are designed for the digital age. Our on-demand interpretation app revolutionizes medical interpretation into the 21st century so your medical staff can easily schedule on-site, in-person interpretation or even request over-the-phone language interpretation from their iPhone, iPad or any Android device. Like Uber and Lyft, Stepes uses the modern mobile network to most efficiently organize our pre-qualified professional linguistic resources and certified interpreters to provide the best language interpretation services the industry has ever seen. Stepes greatly simplifies the language translation process for law firms, government organizations, and law enforcement agencies to obtain legal interpretation services in over 100 languages. Whether you need courtroom interpretation, litigation support in foreign languages for complex international lawsuits, or interpreters for police services (such as traffic violations, crimes, arrests, detentions), we have the experience and technical solutions to deliver simultaneous and consecutive interpreting over the phone, on-site, and over mobile. Stepes’ patented mobile translation solutions disrupts the old language services industry to enable agile, on-demand, and professional interpretation services on a large scale. Stepes’legal translators and interpreters are specially trained and certified for legal best practices and procedures. Need a customized mobile interpretation solution for your organization’s specialized needs? We can customize the Stepes Interpretation App to meet all your organization’s specific language interpreting needs. Are you a multinational company that operates globally? Stepes innovative mobile interpretation solutions make it super easy for your executives and sales professionals to obtain real-time professional human interpretation services in over 100 languages around the world. With Stepes Book a Translator services, scheduling for on-site business interpretation services in advance is as easy as booking a hotel. Since Stepes uses mobile technology to track the location of our interpreters, we guarantee the best local linguists will serve all of your language interpretation needs ensuring the best customer experience. Location-based services (LBS) via modern smart phones are booming. Stepes mobile translation app is the first in the world to use location-based human translators and interpreters to deliver on-demand translation and interpretation services around the clock and around the world. 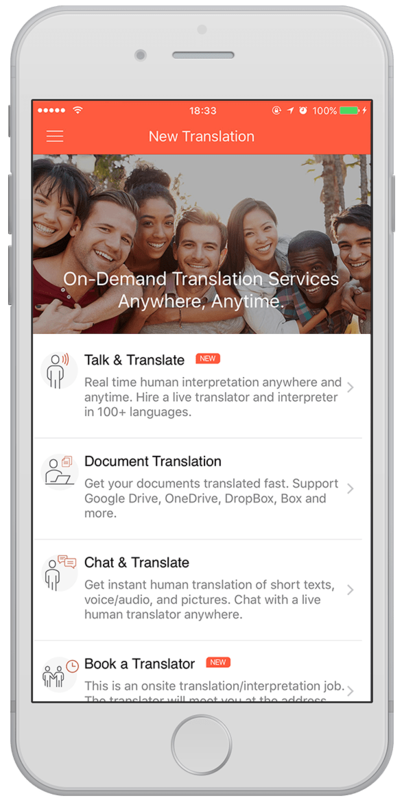 Finally, you can obtain instant human interpretation services anywhere from the best translator app all on your smartphone. Stepes provides over the phone interpretation services via our mobile interpreter platform so you get on-demand multilingual interpreting support when and where you need it. Compared to landline phones, modern mobile smartphones offer many more advantages such as instant service request notifications through SMS, and live video (Face Time) and chat capabilities. Unlike land line phones, our interpreters carry their mobile devices anywhere they go, allowing for much faster response anywhere and anytime. Since mobile devices are also geo-position enabled, Stepes interpretation platform is able to identify the best interpreters who are based closest to the service location for the best local knowledge and language quality. Stepes interpretation services are powered by mobile technology, enabling live interpreting via Apple Face Time on iOS and Google video on Android. Video interpretation allows our customers to see the interpreter face to face, delivering more personal and intuitive language services that are better than ever. The ability to do interpreting over video also allows live demonstration of the subject matter for increased language clarity and improved service experience. Stepes provides a variety of remote interpretation services over the phone and mobile devices through voice, video, image and text chat. Our remote interpreting services can be scheduled in advance or requested live using our game-changing mobile technology. Stepes invented mobile translation so we can provide on-demand and just-in-time interpretation services to our clients instantly and around the clock. Stepes mobile interpreting solution is great of hospital interpretation, courtroom interpreter service, remote business interpreting. Stepes is synonymous to mobile translation and interpretation. Stepes is the first company to create a versatile human powered language translation and interpretation ecosystem in the world. Our mobile solutions disrupt the age old language industry to deliver just-in-time interpretation services around the world and around the clock.